This week I am with the Washington-based artist, Alison Milner Gulland, whose exhibition of Icons is being held at the parish church of St Nicholas, Arundel this coming weekend. Alison gives voice to her artistic imagination through the media of oil, watercolour, collage, print-making and ceramics. The lyrical and textual qualities of her work combine with her rich earthy palette to unite subject and medium. Alison Milner Gulland’s inherent themes and subjects include: landscapes, music, musicians and Icons. I ask Alison where her inspiration to paint Icons comes from. Talking about the ‘Madonna and Child’ illustrated here she answers “The inspiration for this Icon came from a sketch I made at a Sussex Historical Churches Trust talk at St Mary’s in West Chiltington.” I ask whether the image appeared in her imagination. “Yes” she replies emphatically and continues “The scratched, leaf tendrils are inspired by the medieval wall paintings there. I find shapes in things.” The tenderness of St Mary the Blessed Virgin and the Christ child is conveyed with an arresting clarity. Mary’s eyes are averted from us, she is lost in thought whilst the baby Jesus holds us with the intensity of his loving gaze. I adore that this scene is united with a particular church in Sussex. Alison’s Icons follow in, and draw inspiration from an ancient tradition. However, the methods she employs to create these images marks a distinct departure. 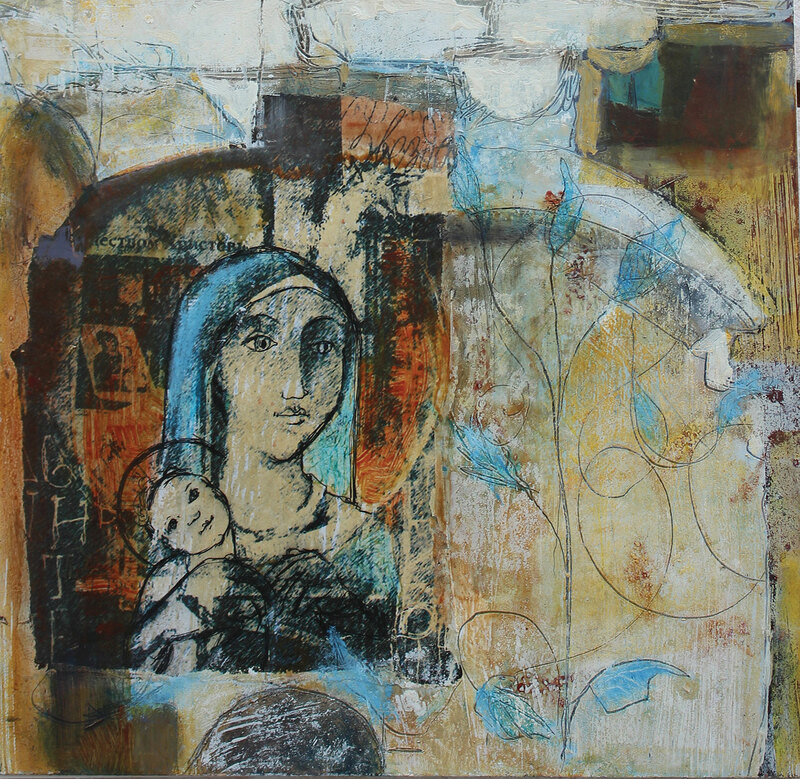 This ‘Madonna and Child’ for example employs print, paint and collage to great effect, whilst the reds and blues show a faithfulness to the colours traditionally employed in depictions of St Mary. In contrast to the serenity of this scene is the less traditional Icon ‘The World Looks on’. 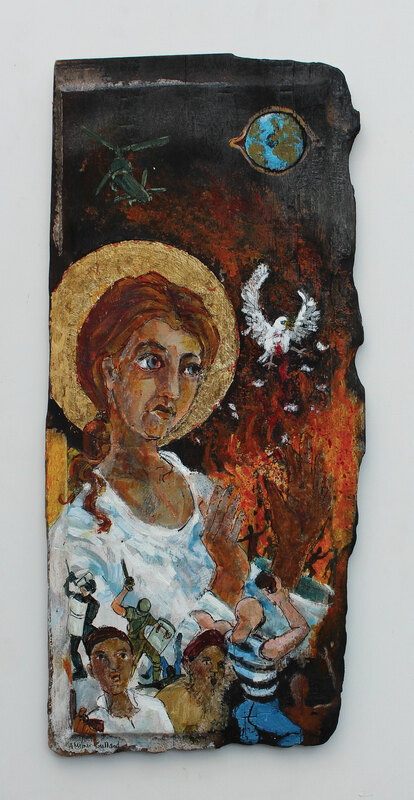 Alison comments “I was inspired to create this work by the charred panel on which it’s painted.” She explains that the images came out of a deeply held concern for those caught up in conflict and in particular for two young men she had met in a Syrian bazaar selling jewellery. She had questioned the authenticity of a piece they offered for sale. This chance meeting and exchange led to Alison finding herself being dragged up a mountain by the two men to watch the setting sun, their lives united by this shared moment. And so this Icon reflects Alison’s continuing concern for these two young men and her hope that they are safe in the tumult of conflict in their country. But the image also speaks of conflict in broader terms. Beneath the military helicopter the dove, a symbol of the Holy Spirit, hope and peace is wounded. An angel holds out her hands in a gesture of concern and blessing whilst rioters in this country and combatants abroad fight and destroy in the sight of the whole world, in the sight of all of us. The process of painting Icons is often termed Icon writing. Writing an Icon is described as a form of prayer, each brushstroke inspired by a form of meditation and reflection. Alison’s working process reflects this. Those that write Icons speak of the importance of being at peace with themselves. To me there is a quality of prayer in these Icons and Alison is at peace in her art and her landscape. 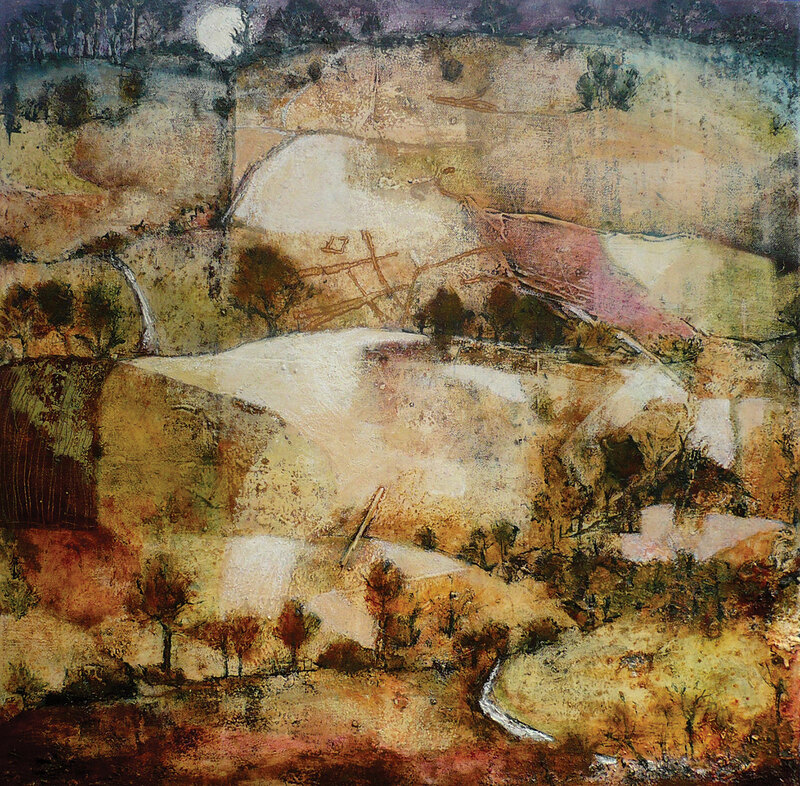 Her Sussex downland landscapes are inspired by memories of riding on horseback through the countryside. “In my imagination the rhythm of the horse combines with the movement in the landscape” she explains. Imagination and memory synthesize enabling her to commit the Downs’ enfolding curves, ancient paths, chalk, pasture and fields to canvas and paper. These landscapes like ‘Moonlight’, illustrated here, are rhythmic. They express something of the ancient and the present. Alison’s Icons invite us to take time to reflect on the needs and blessings of the world, and the part we must play in it. They stimulate thoughts in our imaginations and our hearts and as they do so we find we are engaged in a silent conversation giving expression to our hopes and concerns – which of course is prayer. Perhaps an Icon by Alison Milner Gulland might speak to you and afford an invitation to meditation and prayer at home. Icons can be viewed at St Nicholas’ Parish Church, Arundel between 9.30am and 4.30pm from Saturday 28th September to Tuesday 1st October 2013. I hope to see you there! Alison Milner Gulland’s works including musicians and landscapes are also being shown at the Menier Gallery, London as part of The Society of Graphic Artists 92nd annual open exhibition from 30th September to 12th October; also at the Hop Gallery Lewis and the Moonlight Gallery Hove this autumn. By Revd. Rupert Toovey. Originally published on 25th September 2013 in the West Sussex Gazette. The Brighton Art Fair celebrates its 10th anniversary this year. At the heart of this annual event’s success is the vision of its founders and organisers, Jon Tutton and Sarah Young, to bring together contemporary art of the highest quality by established names, providing a unique opportunity for the public to meet the artists whose work they can buy at the fair. Jon says, “It is rare for the public to have unmediated, direct access to the artist,” and he is right. The art buyer’s relationship with the artist is very often mediated through a gallery or exhibition director. The relational quality that the Brighton Art Fair affords is extremely refreshing. There is a generosity of spirit among the artistic community too, as ideas are shared and expressed. “It helps that the exhibitors understand that we are artists too,” Jon remarks. “It really is important to bring the artistic community together, both artists and patrons.” I think that Jon, with his natural modesty, understates the sense of ownership and creativity which he and Sarah have inspired in their fellow artists. I ask Jon how the Brighton Art Fair came into being and he responds, “It was completely by accident. The idea arose from a conversation with fellow artists in a pub! At the time, there were no venues in Brighton where professional artists could come together and exhibit and sell their work.” Ten years on, how would they describe themselves, as exhibition organisers and directors as well as artists? Jon replies with a wry grin, “Reluctant!” To organise an event like this is a huge amount of work, but it is clear that these two artists are quietly proud of the Brighton Art Fair’s enduring success and what it represents to the visual arts community. Sarah Young works in phases and in recent years she has been focussing on her painting. 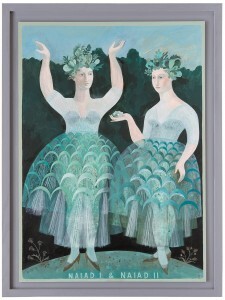 She explains, “For some time the Glyndebourne Gallery has been exhibiting my pictures, which are currently inspired by opera and music.” The work has proved successful with an appreciative audience of music and art lovers. Sarah will be exhibiting again at this year’s Brighton Art Fair. 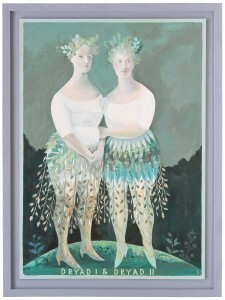 Among her work on show will be two oil paintings, ‘Dryad I & Dryad II’ and ‘Naiad I & Naiad II’. They are inspired by the Richard Strauss opera ‘Ariadne auf Naxos’, which was performed at this year’s Glyndebourne Festival. Both characters are drawn from Greek mythology. Dryad, the nymph or spirit of the trees, and Naiad, the spirit of waterfalls and brooks, accompany the Princess Ariadne on the Island of Naxos, where she has been abandoned by Theseus. The tale ends well and Ariadne eventually finds love with Bacchus. Sarah’s paintings are at once still, out of time and mystical, reflective of the opera. Sarah also continues to work as an illustrator and printmaker. As an illustrator, she has worked for an array of famous publishers, including HarperCollins and Dorling Kindersley. 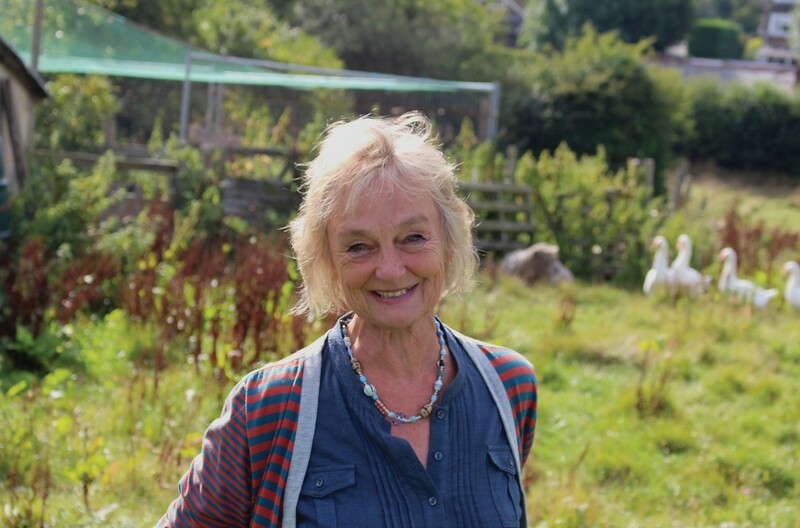 She has illustrated ‘20 Sussex Gardeners’, ‘20 Sussex Gardens’ and ‘20 Sussex Churches’ for the Snake River Press and has contributed to the artistic journal ‘Nobrow’. In 2010, she illustrated ‘Greek Myths’ by Ann Turnbull, published by Walker Books. A work perfectly suited to her subject matter, which often incorporates folklore and mythology, the book is her tour de force as an illustrator to date. Her book cover artwork for ‘Ariel’ by Sylvia Plath was shortlisted for the V&A Illustration Awards in 2011. Working as a painter, printmaker and illustrator, Sarah Young follows in the tradition of the Sussex artists Eric Ravilious and Paul Nash before her. There is a lyrical quality to her work, as there is to theirs. I am always impressed by the particular and coherent voice with which she gifts her pictures, while working in a variety of media. This year Sarah and John have invited the exhibiting artists to create an ‘artistic cube’, which will be on sale for just £30 in aid of the charity Arthouse Meath. Arthouse Meath works with adults living with severe epilepsy and learning difficulties, who have varying needs and abilities. Arthouse Meath employs professional artists of a high calibre, who adapt their working methods to develop these people as artists, so that they become involved in the process of creating saleable artworks. It is extraordinary and exciting how the combination of art and community can be so transformative. Jon concludes, “We are proud that we have a show which artists and visitors enjoy.” His view is clearly supported; last year the Brighton Art Fair attracted more than 6000 art lovers! I think that the Brighton Art Fair’s success is due to the quality of the art and artists exhibited and the generosity of spirit engendered in this event by Jon Tutton and Sarah Young. I hope you will treat yourselves to a visit this weekend and perhaps discover a piece of art for you – at the very least you must buy a cube! The 2013 Brighton Art Fair runs at Brighton Dome Corn Exchange in the heart of Brighton, just around the corner from the Royal Pavilion, from Friday 20th September until Sunday 22nd September. For opening times and further information about the Brighton Art Fair, visit www.brightonartfair.co.uk. More information about the work of Arthouse Meath is available at www.arthousemeath.com. By Revd. Rupert Toovey. Originally published on 18th September 2013 in the West Sussex Gazette. As September progresses, we look to the change of seasons and we have been blessed by a last and precious glimpse of summer before autumn comes. Many of us will be out in our gardens this weekend preparing for autumn, pruning back shrubs and tidying borders. As the ground lies fallow, the structure and design of our gardens holds its own delights. 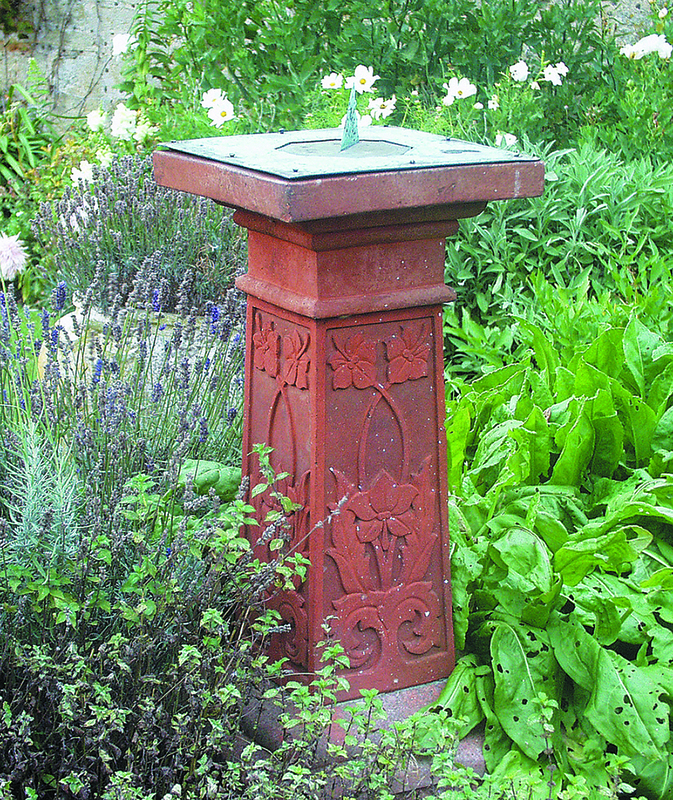 At the heart of these designs architectural features are often to be found: jardinières, sundials and pots. In the late nineteenth and early part of the twentieth centuries a very British expression was given to the Art Nouveau through the Arts and Crafts movement. Among the leading exponents of the Arts and Crafts taste was Liberty & Co. Its founder, Arthur Lasenby Liberty, built the Liberty brand by employing some of the country’s leading designers, though he insisted that they work anonymously. One of these designers was Archibald Knox, who joined Liberty & Co in 1899. Knox was the creative force behind Liberty’s Celtic Cymric and Tudric designs, worked in silver and pewter. In addition to metalwork and jewellery, Knox designed terracotta garden ornaments, carpets, wallpaper and fabrics for Liberty & Co, displaying virtuosity across all of these disciplines. 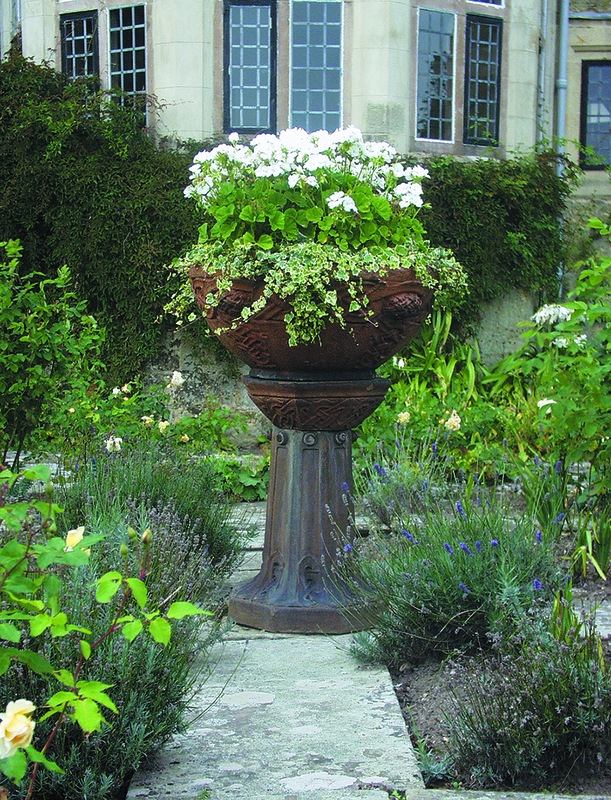 Another notable designer of garden pottery in the Celtic style was Mary Seton Watts. In 1900 she founded The Compton Potters’ Arts Guild. Inspired by the thinking of John Ruskin and William Morris, the Guild sought to celebrate and enable craftsmen through their creative handiwork. Mary’s Compton Pottery quickly became a successful business and it continued to prosper until 1955. The Arts and Crafts gallery, designed specifically to house the work of her husband, George Frederic Watts, was designed by Christopher Turnor and opened in 1904. It also served as a hostel for Mary Seton Watts’ potters. The Watts Gallery in Compton, Surrey, remains open to visitors today and, as well as exhibiting examples of G.F. Watts’ art, it houses over two hundred examples of Compton pottery. My first single-owner collection and country house sale at Toovey’s was held at Little Thakeham, the exquisite Arts and Crafts home designed by the renowned architect Sir Edwin Lutyens in 1902. The contents of the sale reflected the exceptional eye, particular taste and sensitivity to the stylistic quality and period of this important house of its then custodians, my late friend Tim Ractliff and his wife Pauline. 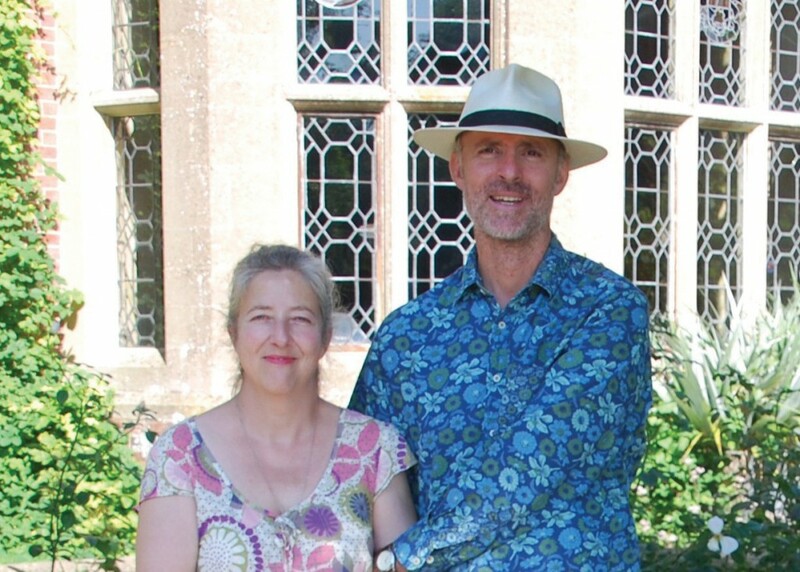 Tim and Pauline loved the house and its gardens, preserving and sharing their home as one of the country’s leading country house hotels. Once sold, Little Thakeham retired again from the public gaze and it remains a very private family home. The garden effects in the auction included the Liberty & Co pottery jardinière illustrated here, which was designed by Archibald Knox. It added focus to the formal garden. The bowl and stem were typically decorated in relief with a Celtic knot design. 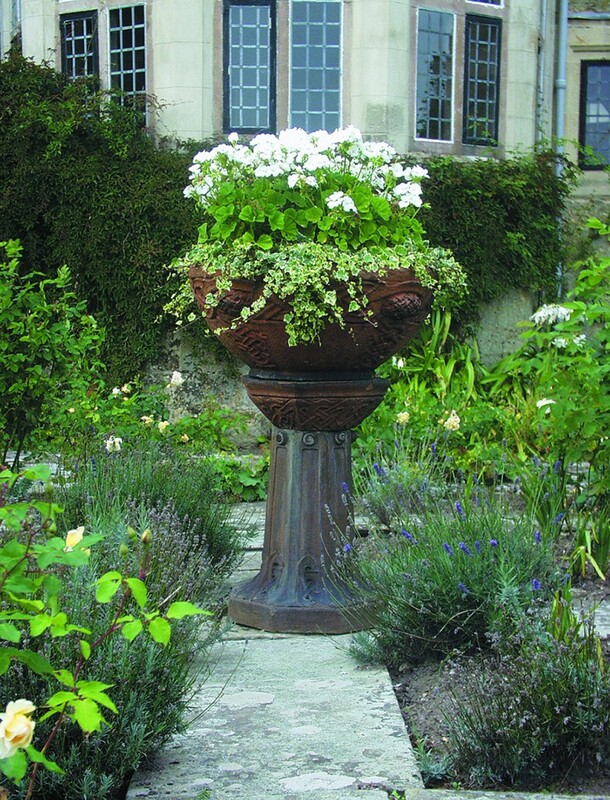 Today a jardinière of this quality and design would potentially realise in excess of £5000. The lavender-filled pot also shown is a famous Compton design and one which is still reproduced today. 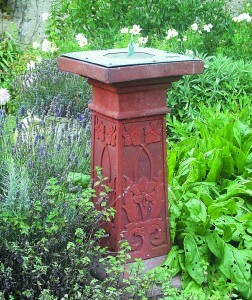 Displaying Mary Seton Watts’ use of Art Nouveau design is the terracotta sundial. Although at the time there was no record of this design being from the Compton Pottery, it can be attributed to Compton by comparing the decorative motif on its stem with a similar one used on a known birdbath from the pottery. Today, an example like this would carry a pre-auction estimate of £3000-5000. We British remain pots about pots, as illustrated by their values. They provide form and focus to a garden. Charming examples can be bought for a few hundred pounds, while the finest collectors’ pieces achieve thousands at auction. 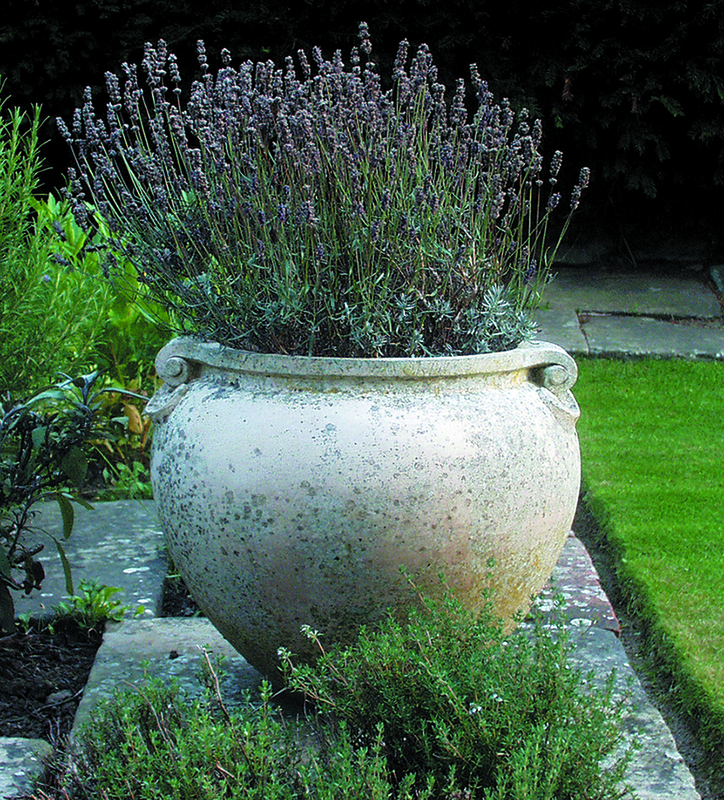 As you tidy your garden for the onset of autumn and winter, perhaps take time to stop and stare and imagine if a pot might work for you! By Revd. Rupert Toovey. Originally published on 11th September 2013 in the West Sussex Gazette. John Piper’s Chichester Cathedral reredos tapestry, circa 1966, depicting the Trinity, the Evangelists and the Elements. Picasso, Matisse, Braque and other celebrated, international artists all worked in collage. The word collage comes from the French verb coller, to stick or glue. The technique was used by both cubists and surrealists. British artists like John Piper, Nigel Henderson and Eduardo Paolozzi all embraced this method of working. The current exhibition Modern British Collage and its Legacy at Pallant House Gallery, Chichester, seeks to explore the role of collage in the course of modern British art. Exhibition curator Katy Norris comments, “Collage evolves in the 20th century from a marginal process to become a central part of the modern aesthetic.” She continues, “It is extraordinary how surrealists, pop and conceptual artists all embrace this method of working.” The works in this captivating exhibition are from the Gallery’s own remarkable collection. The pictures by Ben Nicholson, John Piper, William Scott, Ceri Richards, Nigel Henderson and, of course, Eduardo Paolozzi clearly articulate the importance of collage in British modernism. I am particularly drawn to a preliminary collage design by John Piper for the reredos tapestry at Chichester Cathedral. In his book Patron of Art, Walter Hussey, then Dean of Chichester Cathedral and famous for his patronage of the arts, notes how he chose to follow Henry Moore’s advice to commission John Piper to create a worthy setting for the High Altar. Piper, known for his atmospheric depictions of English architecture and landscape, returned to the abstraction of his earlier work for this commission. A distinguished artist with a great sympathy for old churches, he suggested a tapestry. Tapestry, he argued, would work in concert with the old stonework and the 16th century carved oak screen. He felt that the seven strips of tapestry would be able to be read as a whole across the narrow wooden buttresses of the screen with its crest of medieval canopies. The original plan was to gild and paint these medieval sections but John Piper advised that they should be left plain and his advice was accepted. In January of 1965 Piper presented a final sketch, which met with favourable opinion. At lunch with Hussey and others, however, Piper was deeply troubled when the Archdeacon of Chichester commented that there was no specific symbol for God the Father in the central section of the design. The lack of this symbol in the earlier collage by John Piper, shown here with Katy Norris, is notable. Katy explains, “In this preliminary design we see the early scheme, worked out using simple cut-out shapes, which enabled Piper to trial different pictorial arrangements.” After much consideration, Piper introduced the white light left of centre on the tapestry itself, shown here in situ. The tapestry panels are schematic in their use of symbolism. The Trinity is represented in the three central panels. God the Father is depicted by a white light, God the Son by the blue Tau Cross and the Holy Spirit as a flame-like wing, all united by a red equilateral triangle within a border of green scattered flames. The flanking panels depict the Gospel Evangelists, Saint Matthew (a winged man), Saint Mark (a winged lion), Saint Luke (a winged ox) and Saint John (a winged eagle), beneath the Four Elements, earth, air, fire and water. Woven by the Pinton Frères atelier at Felletin, near Aubusson, the tapestry was installed in the autumn of 1966. Whether we immediately understand the symbolism of the tapestry or not, it speaks to our senses and we cannot fail to be moved on many levels. The work’s length, structure, tone, rhythm and colour have a lyrical quality, which tells of our creator God in His Trinity. 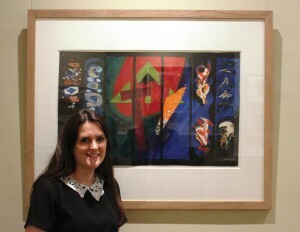 Katy Norris, Pallant House Curatorial Assistant and Exhibition Curator for Modern British Collage and its Legacy, with John Piper’s preliminary collage design for the Chichester Cathedral tapestry, circa 1965. I am excited that Toovey’s Fine Art Auctioneers are sponsoring Modern British Collage and its Legacy at Pallant House Gallery. The exhibition runs until 29th September 2013. While you are there, you must make sure that you also see Eduardo Paolozzi: Collaging Culture and perhaps wander over to Chichester Cathedral and allow the Piper tapestry to move you and delight your senses. It is a wonderful thing to reflect upon as you listen to and join with sung evensong – the modern and the ancient united. 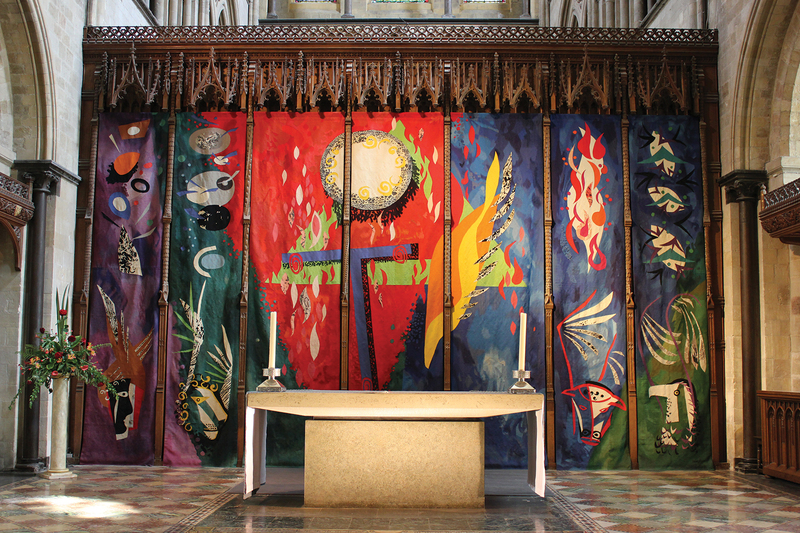 Image1: John Piper’s Chichester Cathedral reredos tapestry, circa 1966, depicting the Trinity, the Evangelists and the Elements. Image2: Katy Norris, Pallant House Curatorial Assistant and Exhibition Curator for Modern British Collage and its Legacy, with John Piper’s preliminary collage design for the Chichester Cathedral tapestry, circa 1965. By Revd. Rupert Toovey. Originally published on 28th August 2013 in the West Sussex Gazette.